The annual National Cherry Blossom Festival Parade® presented by Events DC starts at 10:00 AM ET and travels along Constitution Avenue from 7th to 17th Streets, NW. The Parade takes place rain or shine. Reserved, grandstand bleacher seats are available for sale. 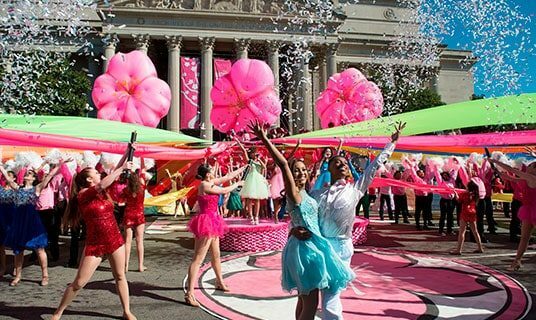 Tickets are $20 each along the general Parade route (where you will see the elements move down Constitution Avenue) and $30 each for the telecast area (where you will see the actual performances that are filmed for television broadcast). Please note that seats are assigned in the order in which payments are received. Reserved, accessible space for persons with ADA disabilities is also available. Please note that accessible seats are limited to one wheelchair and one companion seat, and are no closer to the street or Metro than the regular bleacher seats. Please contact LaKiya Pugh-Rawls, Administrative Assistant, directly at tickets@ncbfdc.org for accessible seating requests. Special Offer Deadline: All orders paid in full will receive two (2) free tickets per 50 tickets ordered. All orders after this date will receive one (1) free ticket per 50 tickets ordered. Refund Deadline: All refund requests must be made in writing to tickets@ncbfdc.org. No refunds will be given after this date. Guarantee Deadline: All group ticket orders must be submitted and paid for; tickets corresponding to orders not finalized by 5:00 PM ET on this date will be released. Ticket Sales End: Last day additional seats (if available) may be purchased. Additional seats are not guaranteed to be placed with the original group’s reserved location. All orders must be placed and paid for by 5 PM ET. Parade Day: Bleachers open for seating at approximately 8:30 AM ET. The parade begins promptly at 10 AM ET.